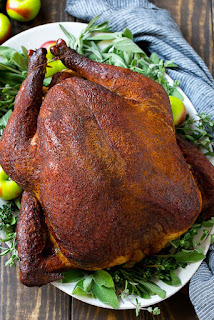 LEARN HOW TO MAKE THE JUICIEST TURKEY! ALL IT REQUIRES IS A FEW KEY TRICKS AND A GOOD SET OF THERMOMETERS TO HAVE A JUICY TURKEY RECIPE PEOPLE WILL RAVE OVER. USE AN INSTANT READ THERMOMETER TO TEST THE INTERNAL TEMPERATURE OF THE TURKEY TO MAKE SURE THAT NO PART OF IT IS FROZEN. INTERNAL TEMPERATURES SHOULD BE ABOVE 32 DEGREES F. REMOVE THE TURKEY FROM ITS PACKAGING AND PLACE ONTO A ROASTING PAN. DISCARD NECK AND GIZZARDS. FILL TWO PLASTIC SANDWICH BAGS WITH ICE. CLIP THEM TOGETHER AND PLACE THEM ON THE BIRD SO THAT THE ICE CAN CHILL BOTH BREASTS. LET SIT AT ROOM TEMPERATURE FOR 1 HOUR, THEN DISCARD ICE BAGS. PREHEAT AN OVEN TO 350 DEGREES. STARTING AT THE NECK CAVITY, LOOSEN THE SKIN FROM THE BREAST AND DRUMSTICKS BY INSERTING FINGERS AND GENTLY PUSHING BETWEEN THE SKIN AND MEAT. PLACE SLICES OF BUTTER IN BETWEEN THE SKIN AND THE MEAT. IN A SMALL BOWL, STIR TOGETHER PAPRIKA, OREGANO, BASIL, SALT, PEPPER, ONION POWDER, AND GARLIC POWDER. SPRINKLE OVER THE SKIN OF THE ENTIRE TURKEY AND RUB IN TO COAT. INSERT AN OVEN SAFE THERMOMETER PROBE SO THAT THE TIP OF THE PROBE IS IN THE CENTER OF THE BREAST OF THE TURKEY. THE PROBE SHOULD BE INSERTED FROM THE NECK AREA AND BE PARALLEL TO THE ROASTING PAN. BAKE IN THE PREHEATED 350 DEGREE OVEN UNTIL THE INTERNAL TEMPERATURE OF THE BREASTS REACHES 150-155 DEGREES. BASTE 1 TO 2 TIMES IF DESIRED. USE AN INSTANT READ THERMOMETER TO TEST DIFFERENT PARTS OF THE BIRD FOR DONENESS AND TO ENSURE THAT THE BREAST MEAT REALLY IS 150-155 DEGREES IN THE CENTER. THE DARK MEAT IN THE LEGS SHOULD REGISTER BETWEEN 175 AND 180 DEGREES F.
ONCE THE INTERNAL TEMPERATURES REACH THEIR DESIRED LEVEL, LET THE TURKEY REST 20 MINUTES BEFORE CARVING.